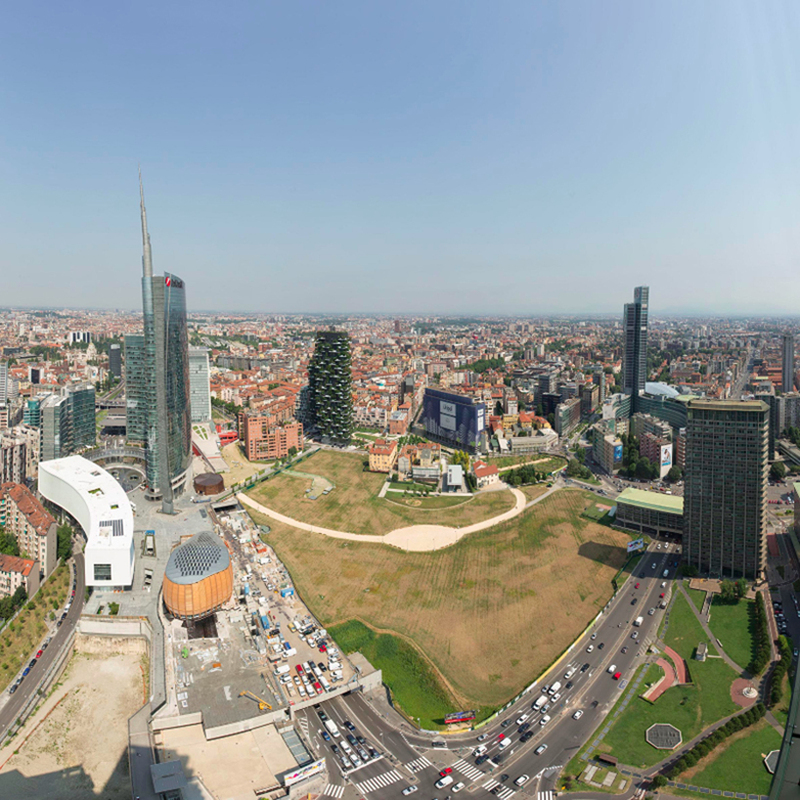 fondazione nicola trussardi specially curates exhibitions presented within vacant buildings in milan, italy. 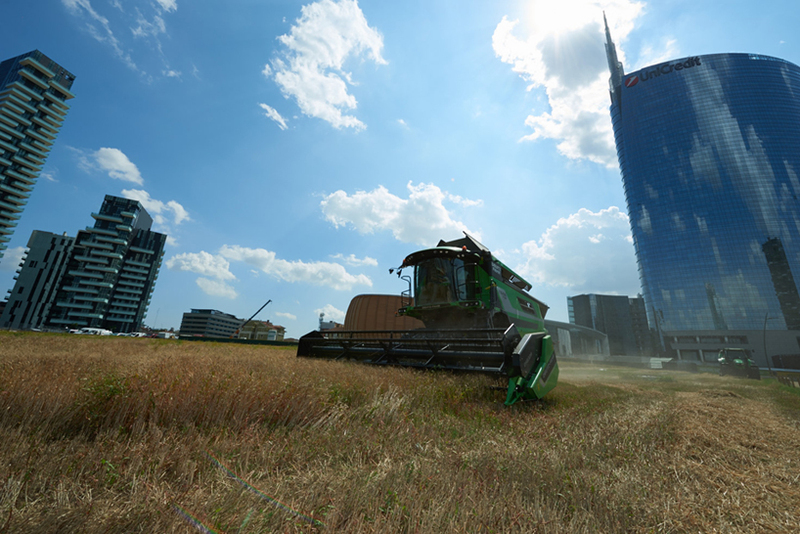 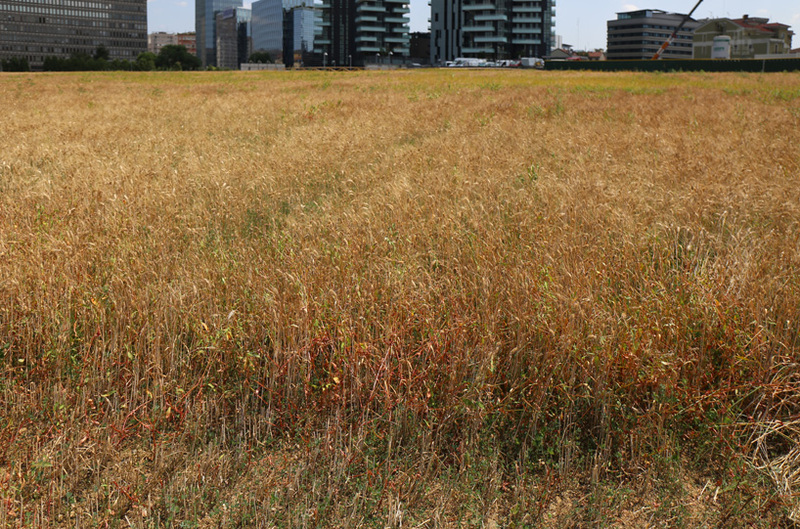 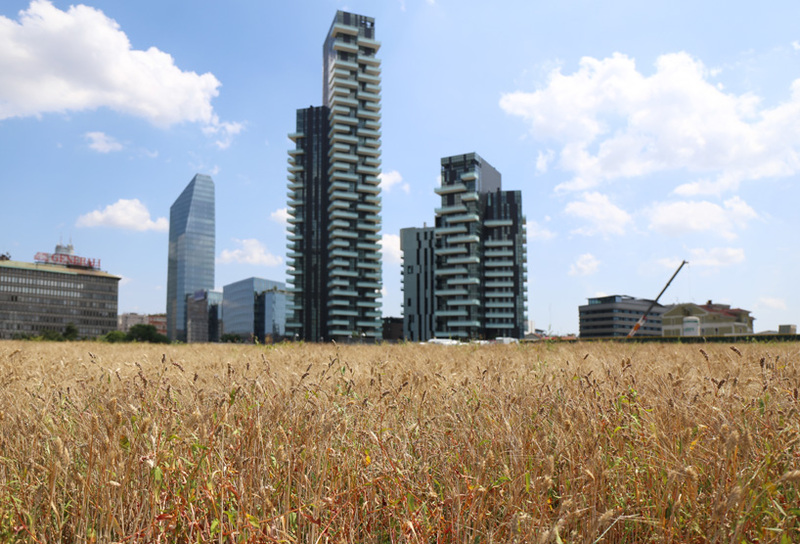 in a large environmental installation, american artist agnes denes takes over five hectares of milan’s porta nuova neighbourhood, transforming the site into an agricultural ‘wheatfield’. 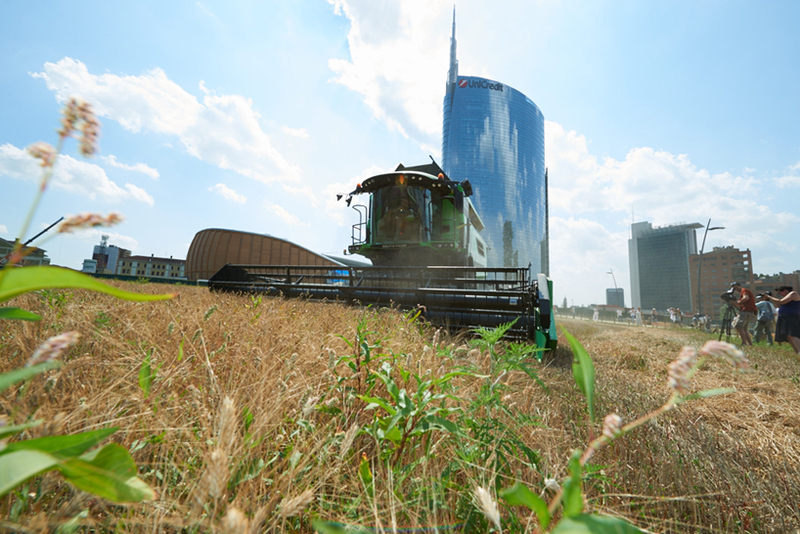 the open space — positioned in the middle of skyscrapers and futuristic buildings of the city’s quickly developing skyline — was planted during a public sowing in february of this year in which 15,500 cubic meters of soil were transported to the area, and 1250 kg of odisseo variety seed (250 kg per hectare) were cultivated; in addition to the use of 5000 kg of fertilizer. 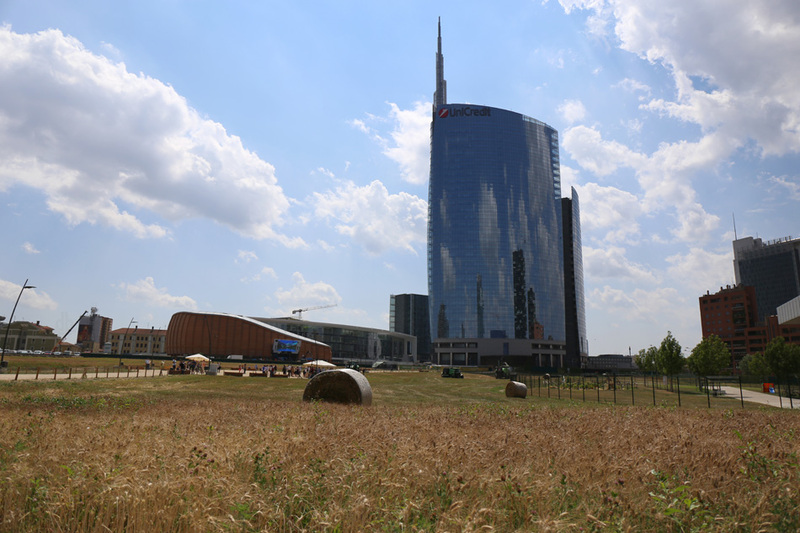 situated in a public and partially residential urban setting, no agricultural sprays were used in its creation. 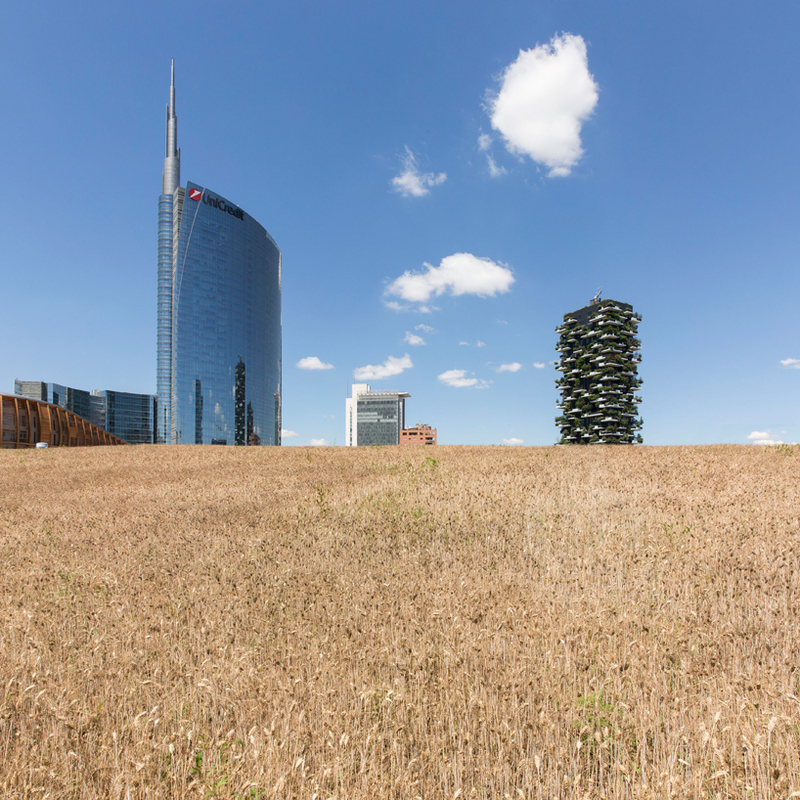 ‘wheatfield’ was first carried out in new york in 1982, as a means of reflecting on issues of ecology, climate change and the future of the planet — all subjects which are even more pertinent in our contemporary society. 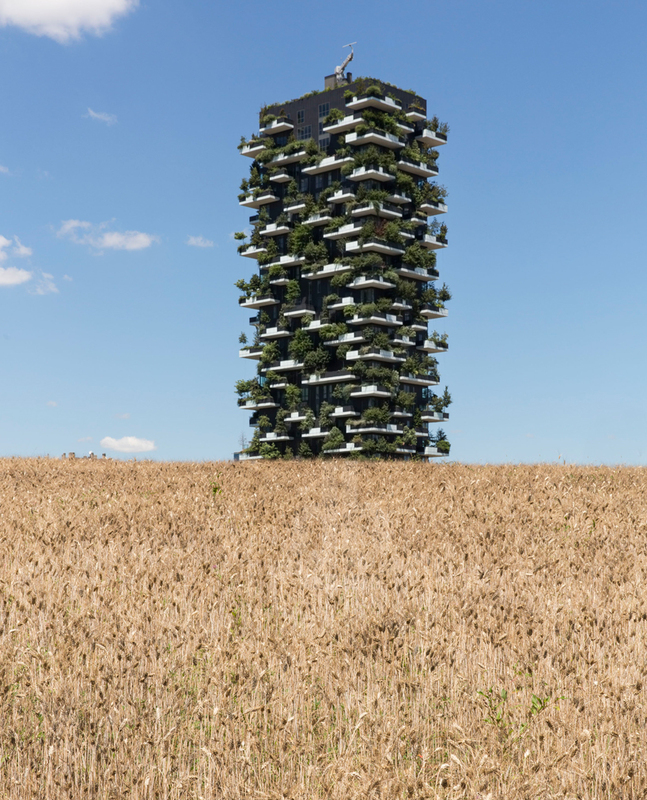 the milan intervention has been realized by the fondazione riccardo catella, in partnership with fondazione nicola trussardi and confagricoltura to run during the 2015 expo, to reiterate the world event’s message of returning to the concrete simplicity of the land, the source of all life and prosperity. 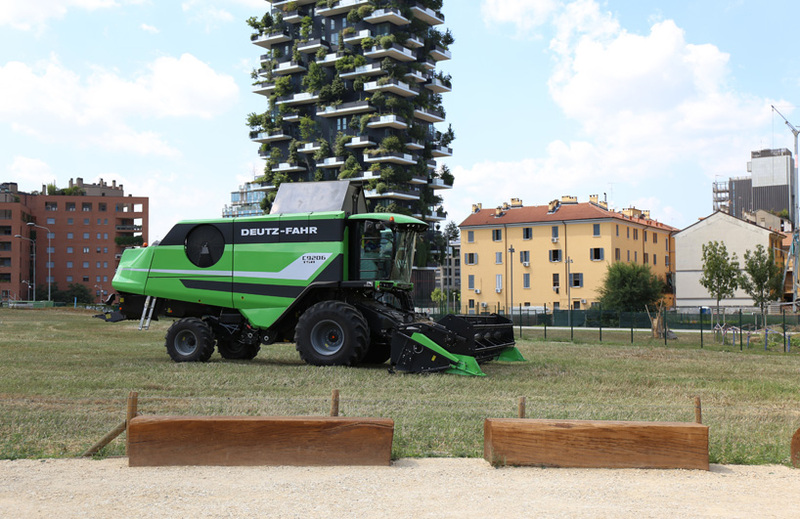 it also stands as a driving force for building community and social engagement, getting the public and local inhabitants involved in every stage of an experience that is closely tied to italy’s agricultural history. 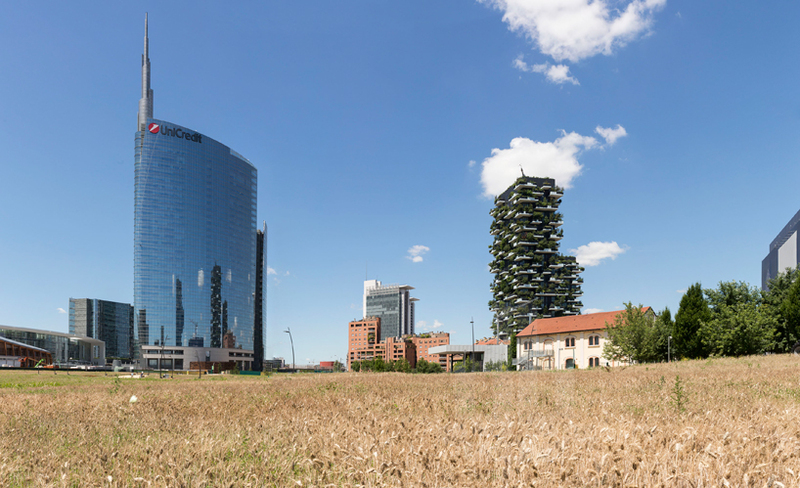 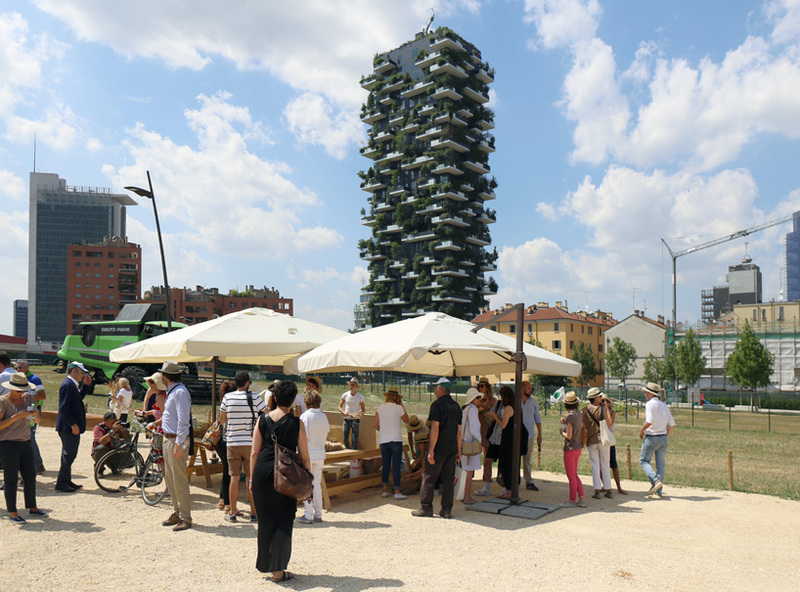 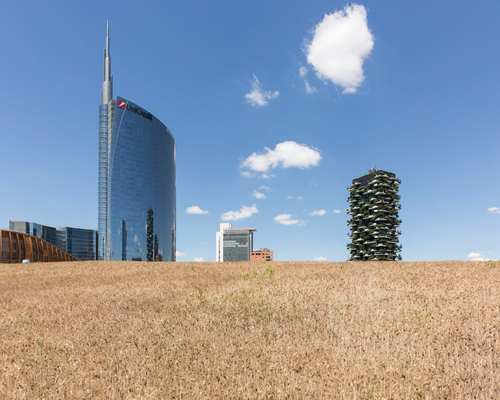 ‘wheatfield’ also sees the opening of a footpath that restores the porta nuova area of the city after 50 years of closure, and is growing within the perimeter of a future public park ‘biblioteca degli alberi’ (‘library of trees’ in italian). 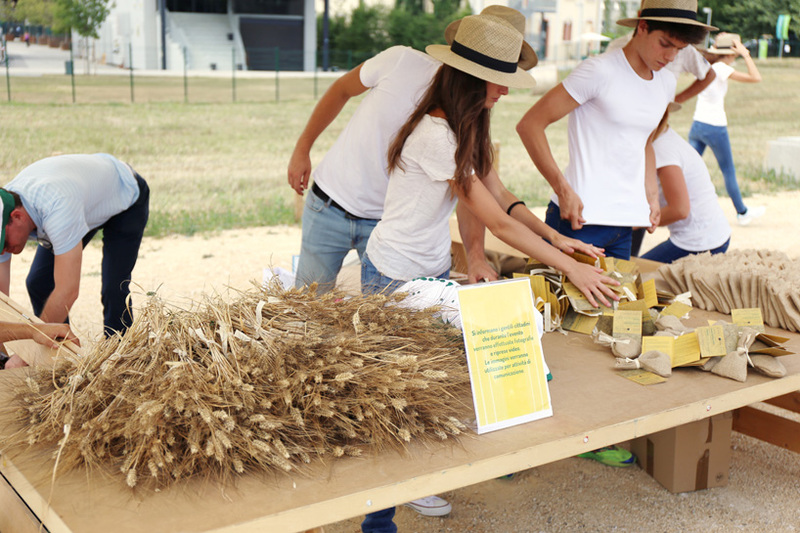 a special event on july 9th, 2015 invited tourists and locals to participate in a great harvest celebration, in which the land was reaped, everyone taking home a bundle of wheat and a bag of the seeds that were used to cultivate the plot. 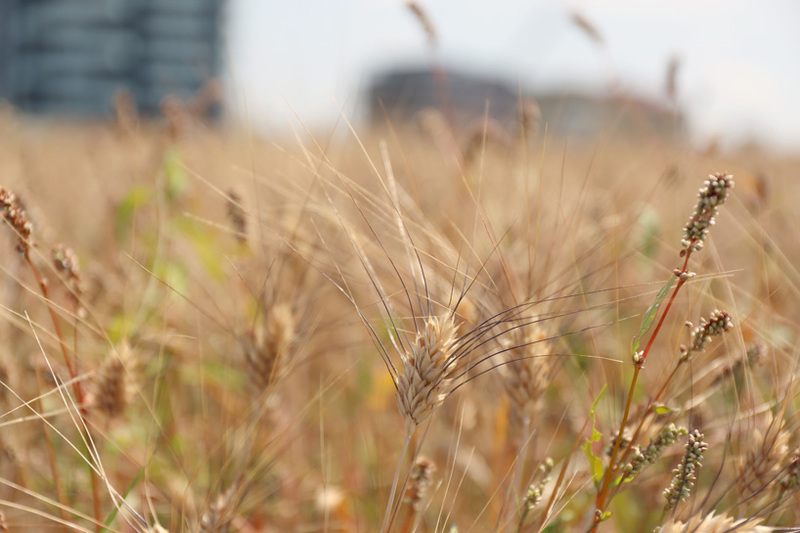 with this gesture, denes seeks the opportunity to ask that we ‘plant seeds for the future generations to harvest‘, asking us all to carry the message of ‘wheatfield’ into our lives — that we should take responsibility for our own future, and the future of generations to come, to whom we must pass on fundamental values like sharing stewardship and solidarity. 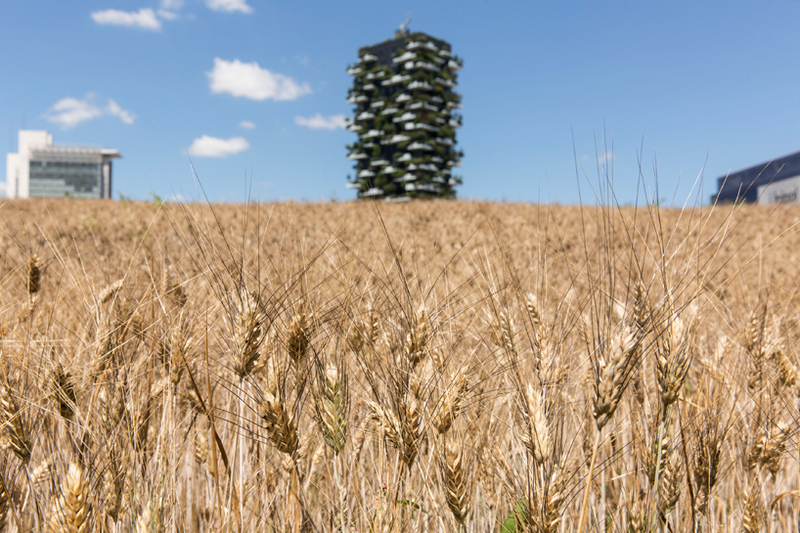 a questionnaire was prepared by the artist encourages the public to reflect on the state of our natural environment and the effects of global warming on our planet; with the data and responses being collected and preserved in a special time capsule. 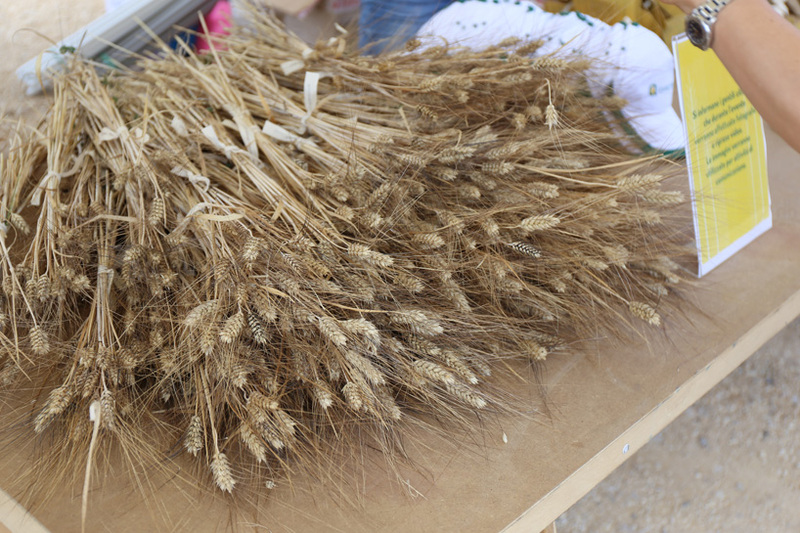 the performance also revealed secrets of the harvest, as well as demonstrating ancient techniques of reaping wheat with scythes and threshing it with flails — to modern operations of a combine and baler. 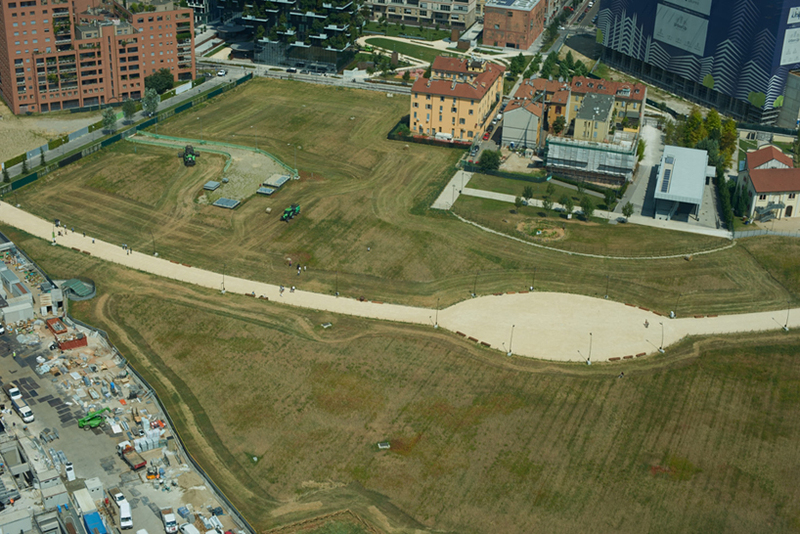 the artwork is at part of the ‘micoltivo: the green circle’ urban revitalization project that is part of fondazione riccardo catella’s calendar of civic and cultural initiatives dedicated to the porta nuova smart community in 2015.